This time each year I usually come across a vegetable that then becomes a borderline food obsession and this year it’s cavolo nero’s turn. Cavolo nero, also known as black cabbage or Italian kale, is perfect for pepping up soups, stews and pastas. I have kept this recipe as simple as possible so each constituent ingredient can be tasted and savoured. 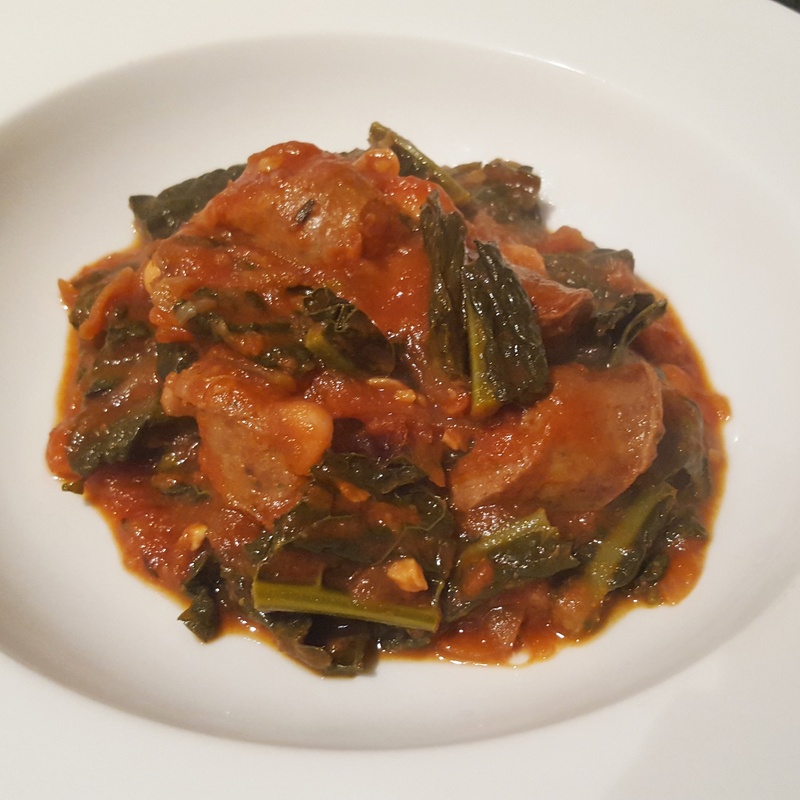 I used venison sausages for this recipe as the rich flavour goes well with the irony flavour of the cavolo nero and the creamy cannellini beans. A lot of casseroles and stews use red wine in the base but I have gone for a dark ale to create depth in place of wine so give it a try! 1. Start by preheating the oven to 180c/ 160 fan. Take a large casserole pan and add a glug of oil; heat to medium and brown off the sausages. Turn them as you go to ensure they are uniformly golden; remove from the pan when they are ready, cut into thirds or quarters and set aside. 2. Using the same pan, fry the onion and garlic together for a few minutes until they soften but don’t colour. I add salt at this point to help draw the moisture from the onions. If you have found that the sausages have given quite a bit of fat then do drain some of this away before adding the onions. Next up goes the tomato puree which should be stirred through the onion and garlic to give a coating; cook for a minute or two before adding the ale. Reduce the volume of the ale by half. 3. Add the beans to the pan and combine well with the onion, garlic and ale mix before adding the stock and passata. Drop in the thyme and add the sausage and cavolo nero; bring to a gentle boil before popping in the oven for 60-75 minutes. Don’t be alarmed if the cavolo nero looks like a lot- it will cook down as the casserole is in the oven. Serve with a creamy mound of mashed potato or hunks of bread and enjoy. Venison sausage, cavolo nero and bean casserole- a satisfying dinner for those dark, chilly nights! There’s a distinctive chill in the air so this recipe is a perfect autumnal warmer. I have used a good quality beef sausage as a bit of a change but you could easily swap it for pork sausages if you prefer. I have used beef sausages from Chiphall Farm who use Woodland Jersey herd meat so check them out http://www.chiphallfarmshop.co.uk to support excellent Hampshire producers. 1. Preheat the oven to 190c/ 170 fan and leave to warm up whilst you get started with the rest. Heat the oil in a heavy based casserole pan over a medium heat and brown the sausages until they are golden all over; this should take about 10 minutes to get a good colour on them. When they are ready, set them aside to keep warm. 2. I then add the onion to gently fry off in the residual sausage fat as this adds an extra layer of flavour. If you find that a lot of fat has come out of the sausages you can drain some of this off if you lilke. A higher quality sausage usually produces less fat so that’s worth remembering. When the onions are nearly ready, add the garlic and celery and cook for 1- 2 minutes. 3. Squeeze in a tablespoon of tomato puree and cook this off well for another couple of minutes. Add in the red wine and simmer this to reduce it by half to cook off the booze. If using pork sausages you may also like to try using white wine for a lighter flavour to balance the pork. 4. Add the stock, tomatoes, bay leaves, thyme, pinch of caster sugar and season well. Bring it back up to a gentle simmer for a few minutes before adding the beans and sausages to the pan. Cover the pan and cook in the oven for an hour. The stew will have thickened and a rich, comforting meal will be your reward. Serve in warmed bowls with some bread on the side to soak up the juice. 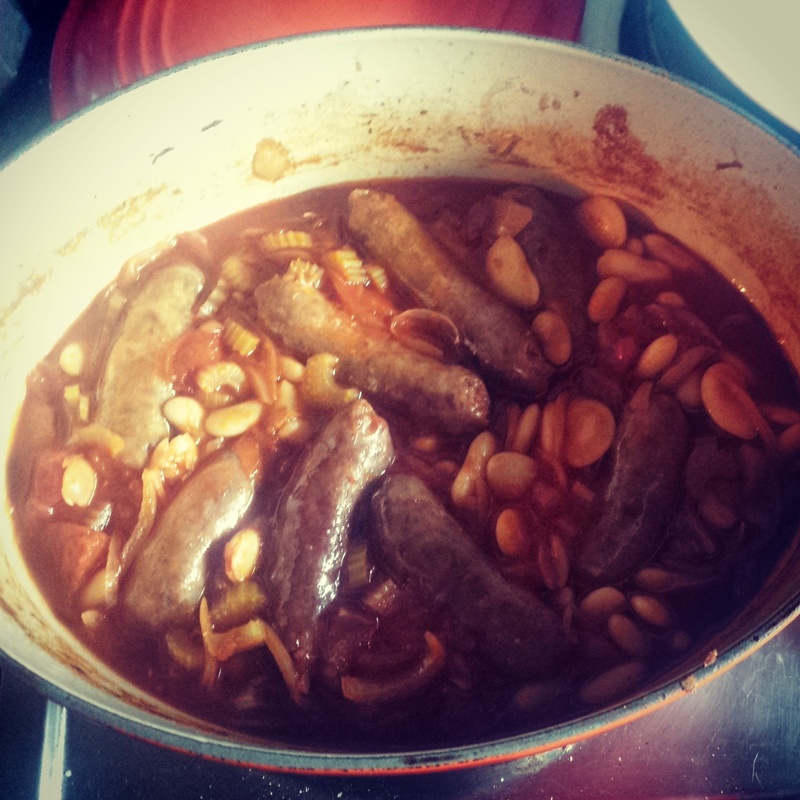 Autumnal sausage and bean stew- a perfect meal for the changing season!